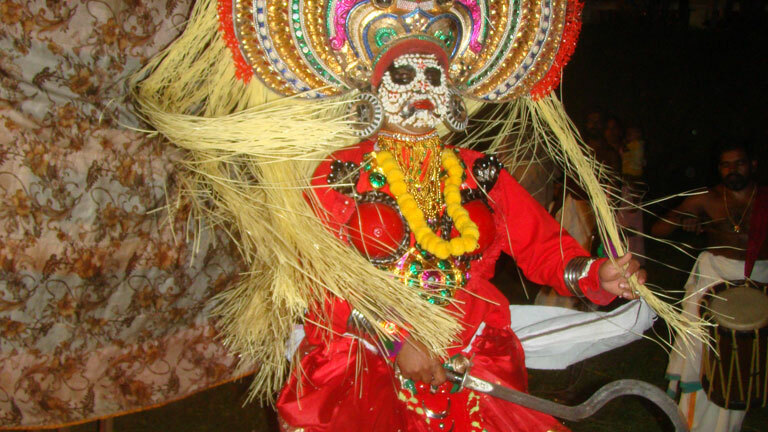 Mudiyettu is a ritual art form performed to appease Goddess Kali (called Durga, in many other places) prevalent in South Kerala and Kochi and rarely in central Kerala. It is also known as Mudiyeduppu. Mudi refers to the headgear of Kali, with her terror-inspiring face and her wild hair, made of wood or metal. The instruments played during the ritual includes Veekku chenda, Uruttu chenda, Ilathaalam and Chengila. The mudi is put on the actor playing the role of Goddess Kali at the temple. A ritualistic drawing (Kalamezhuthu) of Goddess Kali is made with powders in five colours. The image drawn is that of Kali holding the bloody head of her enemy Darika (demon king). In certain rituals special songs known as Kalam pattu are followed. Later the kalam is erased and the stage is set for the Mudiyettu. The characters involved in the Mudiyettu ritual are Bhadrakali, Narada, Darika, Shiva, Daanavendra, Koyichaadar and Kooli. The characters first appear on stage are Shiva and Narada. This is followed by the Purappaadu of Daarika and then that of Kali and Kooli. Once the main characters enters the stage and face each other with battle cries is followed by the entry of the Koyichadar, after which the battle begins. The Mudiyettu ends with a victorious Kali entering the stage holding the head of Darika, followed by a song of praise to Shiva. The Mudiyettu ritual is begun soon after the setting of the sun and goes on till just before sun rise. Recently Mudiyettu was inscribed in the UNESCO’s Representative List of the Intangible Cultural Heritage of Humanity and becomes the second art form from Kerala after Kutiyattam.